The work was carried out on the short ferries Dunkerque Seaways, Dover Seaways and Delft Seaways, all which are operated by the Danish shipping company DFDS, in a total of 30 days. Each vessel was drydocked for a period of 10 days and was fitted with four new Uninterruptible Power Supply units (UPS), providing each engine its own dedicated UPS. The UPS deliver near instantaneous protection from input power interruptions, unlike emergency power systems or standby generators, by supplying the vessel with energy stored in batteries. SeaKing also overhauled the ferries’ lighting and installed four ABB Human Machine Interface systems in the motor control room. 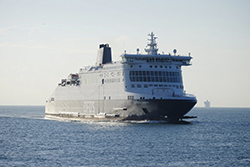 This contract follows work by the electrical engineering company on passenger and car ferries operating in the English Channel between Dover and Dunkerque last autumn, in which 80 cabins received upgrades to their electrical systems and VDSs (Variable Speed Drives) were fitted to car deck vent fans. SeaKing has seen a surge in ferry and passenger ship projects in recent years, where thruster systems, radar, navigation and steering gear feedback systems are often in need of maintenance. In 2018, it completed projects on 26 superyachts alone. “Over the years our close connection with neighbouring shipyard Cammell Laird, and in particular work on high profile military contracts, has encouraged a culture of continuous development and stringent internal management systems”, said Dave Gillam, the managing director of SeaKing Electrical.